Key Difference: Cake and Pastry, both are baked products and are made from flour. Cake is generally made from a mixture of flour, sugar, eggs, and butter or oil whereas the pastry, usually a sweet desert, essentially includes a fat that is solid in room temperature. Most of us have a sweet tooth and thus cannot stay away from sweets. There may be few people who do not like to get indulged in cakes and pastries. Cakes usually remind us of ceremonies like birthdays and weddings. Pastries can be associated as a related version of cake. Sometimes pastry refers to any of various baked foods that are made of dough or batter, and in that sense cakes may also fall in the same category. However, there are some points on which a little distinction can be made. This distinction is made on the basis of the usage of these words in a broad sense. Cakes are of various shapes. The most popular shape is always a round shape. The cakes also are available in various flavors like vanilla, chocolate, black forest, etc. 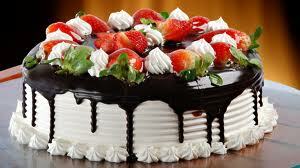 Cakes are generally decorated with icing creams and various other items like berries etc. Cakes are usually cut on birthdays, where the candles signifying the age is laid upon the cake and then the birthday boy or girl is supposed to blow off the candle. Cake is a dessert made from sweet bread. Earlier cakes used to exist in form of normally fried breads or cheesecakes but now cakes have taken more versatile forms. The general recipe of cake requires flour, sugar, eggs, oil or butter, milk or butter and any leaving agent. Additional ingredients can be according to the desired flavour. Cake comes in different varieties, like a sponge cake that is made by preparing a runny batter. On the other hand, the batter of fruit cake is generally stiffer. Most of the cakes are made by using self raising flour. Oxford Dictionary defines pastry as ‘a dough of flour, fat, and water, used as a base and covering in baked dishes such as pies’. Fat in the dough refers to the fat that is solid at room temperature; for example, butter, lard or margarine. Pastry uses a mixture that primarily consists of flour and fat. The flour is generally wheat flour. The wheat flour is kneaded into plain dough with water. It develops the strands of gluten. Gluten is a substance that is responsible for the elastic texture of dough. Pastries have been evolved and many variations from the basic recipe of flour, fat and water, have been obtained. One of the famous pastry of 14th century is known by the name ‘hot water crust’. 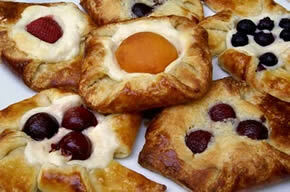 There are numerous kinds of pastries. A crumbly short crust pastry can be prepared by adding 1 part of fat with 2.5 parts of floor. A puff pastry has several layers and the fat is not thoroughly mixed in its mixture. A sweet pastry has the sugar apart from other basic ingredients. They both are prepared from flour and are baked products. However, they differ in the type of flour that is used to prepare them. Cake flour contains less protein than pastry flour, as the protein promotes the creation of gluten. A cake is a stand alone sweet dessert, whereas the pastry can be sometimes used as standalone or can be added to other food items like added in the making of pies. The given differences are the best..